Valuation metrics in the healthcare sector. Biotechnology looks significantly underpriced relative to historical averages combining 3 valuation ratios, but the profitability metric is below the historical baseline. Ratios are mixed for pharmaceuticals: price/earnings is good relative to the historical average, price/free cash flow is excellent, but price/sales and return on equity are very bad. Other healthcare industries are overvalued by at least 20% and much more for some of them. Combining all metrics, healthcare equipment is the worst-looking group in the sector. Life science tools/services is the only healthcare industry above its profitability baseline, but it is also the second worst one in valuation. P/E has improved in biotechnology and pharmaceuticals, and deteriorated in healthcare technology, equipment and life science tools/services. P/S has improved in biotechnology and pharmaceuticals, is stable in life science tools/services, and deteriorated elsewhere. P/FCF has improved in biotechnology and pharmaceuticals, is stable in healthcare equipment, and deteriorated elsewhere. ROE is stable in pharmaceuticals and life science tools/services, and deteriorated elsewhere. In 1 trailing month, the Health Care Select Sect SPDR ETF (XLV), the SPDR Biotech ETF (XBI) and the iShares Nasdaq Biotechnology ETF (IBB) have lagged the SPDR S&P 500 ETF by 5% to 6.2%. The five best performers among S&P 500 healthcare stocks on this period are Align Technology Inc. (ALGN), Cerner Corp. (CERN), Edwards Lifesciences Corp. (EW), Illumina Inc. (ILMN), and WellCare Health Plans Inc. (WCG). The stocks listed below are in the S&P 1500 index, cheaper than their respective industry factor for price/earnings (excluding extraordinary items), price/sales and price/free cash flow. The 10 companies with the highest return on equity are kept in the final selection. Quantitative Risk & Value Members have an early access to the stock lists every month before they are published in free articles. This is not investment advice. Do your own research before buying. 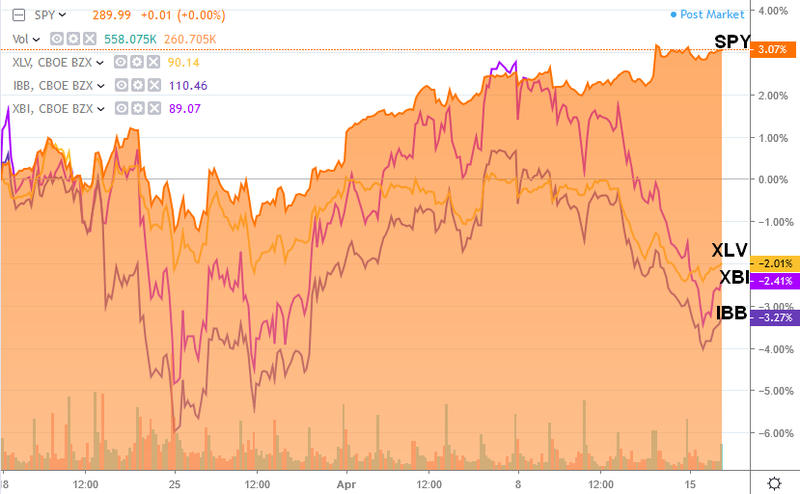 The next chart compares the price action of XLV, XBI and IBB with the benchmark in 1 month. Disclosure: I am/we are long XBI,BIIB,CELG. I wrote this article myself, and it expresses my own opinions. I am not receiving compensation for it (other than from Seeking Alpha). I have no business relationship with any company whose stock is mentioned in this article.